We have reached our $6 million goal, thanks to all of you!!! We are grateful for your generosity for our day-to-day operating expenses. Check back here for occasional Mass time changes. United with Our Lady at the foot of the Cross, the Benedictines of Mary, Queen of Apostles seek above all else, a life of union with God in prayer as guided by the Rule of St. Benedict. Totally consecrated to the Queen of Apostles, we take Our Lady's hidden life at Ephesus as an inspiration for our own. We seek to be what she was for the early Church: a loving and prayerful support to the Apostles, the first priests, and daily offer prayer and sacrifice for the sake of her spiritual sons. We cannot preach the Gospel to the nations nor bring the Lord to our tabernacles, but we can be "Love in the heart of the Church" with firm adherence to her teaching, loyalty to the Holy Father, and deep-seated love of the traditional liturgy. In the company of Our Lady we contemplate the great High Priest, interceding for the sacred priesthood. 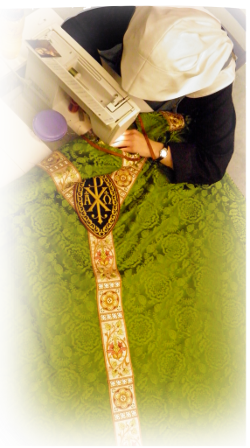 Aside from the maintenance of the community, all other works of our hands are directed toward the glory of the altar in the making of vestments and altar linens. 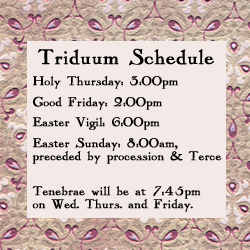 Customary Benedictine hospitality is an integral part of our life. Particular attentiveness is given to welcoming priests, the apostles of our day, and our retreat quarters are principally intended for them. Our hope is that they will find what the Apostles found at Our Lady's home at Ephesus: encouragement, and a spiritual haven conducive to rest and prayer. We have been richly blessed by God thus far with vocations, zealous young women imbued with the call to offer their lives to Jesus, through Mary, on behalf of all priests. Please pray that God Who has begun His work in us may bring it to fulfillment.